Clear aligners are the most versatile and convenient choice among all orthodontic treatments. Made of a clear, flexible material, orthodontic aligners are comfortable, virtually invisible and removable, making them a popular choice for adults and teens who are seeking a more discreet approach to straightening their teeth. 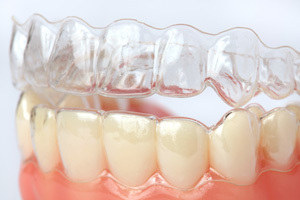 Clear aligners treat the same bite and alignment issues that traditional metal braces do, without the brackets and wires. One of the leading brands we offer for clear braces are Invisalign.